I don’t know about you, but every time I see one of my horses laying flat out in the pasture, I immediately run over and wake him/her. I mean, I know I shouldn’t but they look dead to me. Every single time I see one of my horses sleeping, he looks dead. My heart stops and I quit breathing as I squint my eyes to see if I can detect any visible movement in his chest. No ears twitching, no chest heaving, no movement at all. Ahhhgh! He’s dead! I knew it. I knew this day would come! 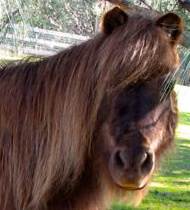 He’s keeled over in the pasture. With my heart pounding out of my chest, I race out to my poor, sleep-deprived animal and… pounce! Horse: (startled) Oh for heaven’s sake, Human! I’m just sleepin’ here. Do you mind? You scared the heck out of me! Me: OH THANK GOD YOU AREN’T DEAD! Horse: Of course I’m not dead. Go away, please. 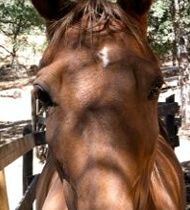 Horse: Ohfercriminnysake, if you are so happy, bring me a cookie! 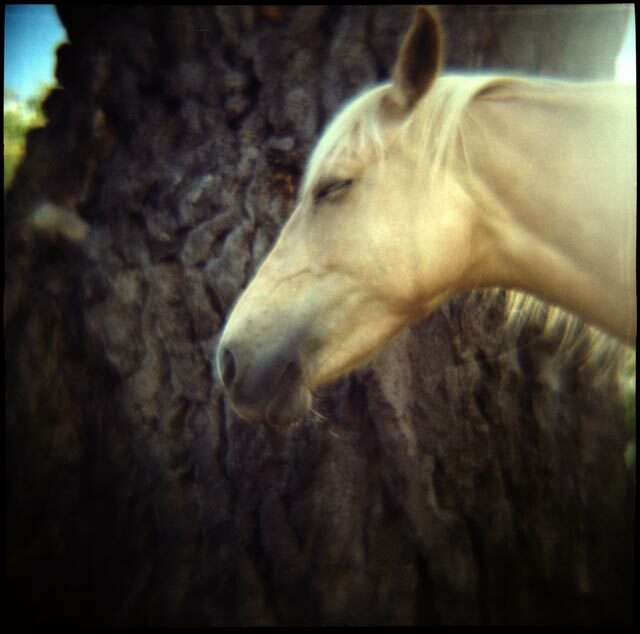 Sometimes a horse that is sleeping looks dead because of their position. 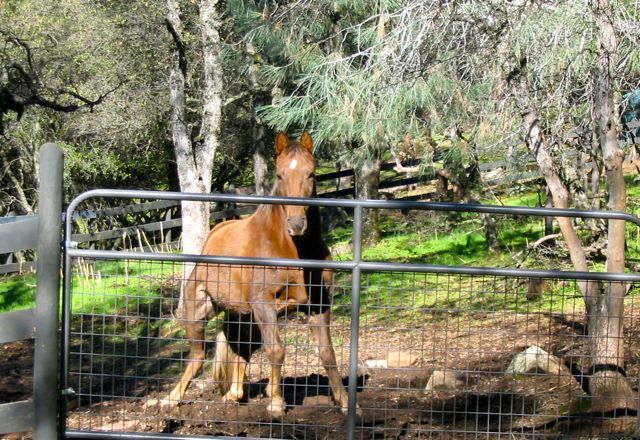 For example, the other day Finn was laying completely horizontally and not moving right in front of the gate to his pasture. First of all, he never hangs out there. Secondly, it was wet and muddy there. Thirdly, it is an odd downward slope and I cannot imagine that any sleeping horse would find that angle comfortable. I flew into a panic! Finn is dead! I ran over to his pasture yelling his name. “FINNY! FinnyFinnyFinny! FIIIIINN! Me: No, I’m just so glad you are alive! Finn: What is wrong with you?! OK, it is true that one horse usually stands watch while the others sleep. But to me, this makes the scene even scarier… How do you know if the standing horse is the watcher or if he is holding vigil over his fallen friend? Luckily, most horses sleep between midnight and 4am. 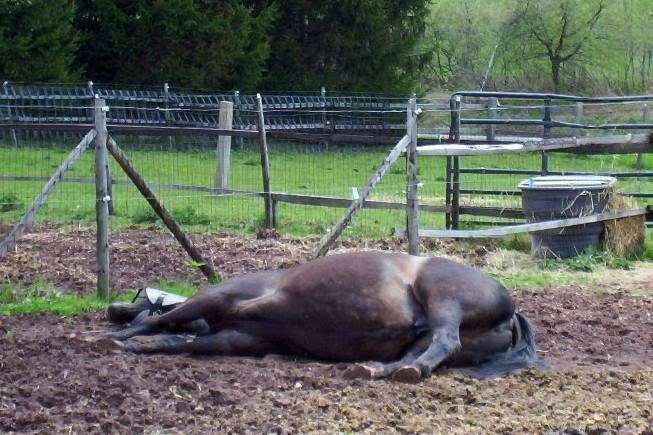 Consequently, we humans aren’t startled into thinking our horses are dead as often since we are generally sleeping, too. 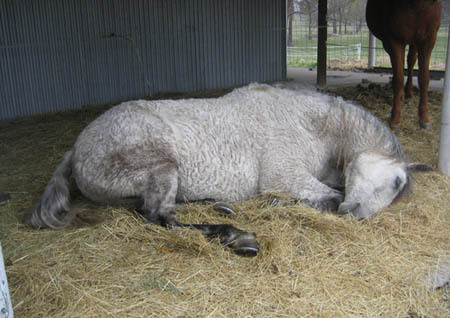 This ‘wee hours of the night’ horsey sleep pattern probably answers the question of why some of you have never seen your horse sleep lying down. 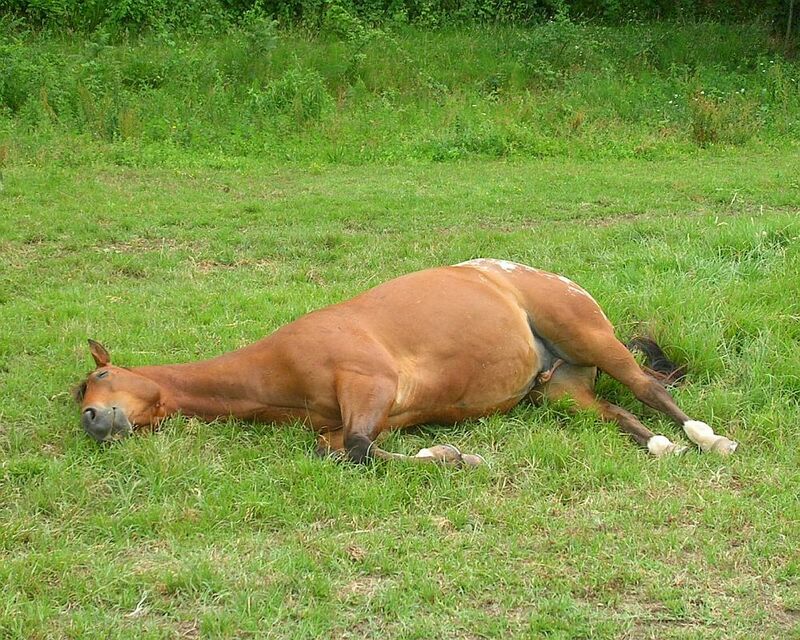 You can now assume that your horse does lie down to sleep but he does it when YOU are laying down sleeping as well. You just are missing it. I know that horses need to lie down because when Aladdin was sick, he stood for 38 days straight while in the Equine hospital. (This was documented.) We knew that he was afraid to lay down because he wasn’t sure if he could get up. The poor guy was loopy. I swear if he was a human, he’d have had that bleary-eyed New Parent No Sleep look. Poor guy was miserable. Finally, once he had sufficiently recovered, Aladdin slept on the ground. He did this periodically daily throughout the next few weeks until he had caught up. Baby pillow! 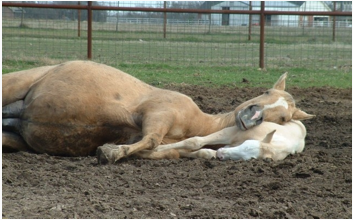 It looks as if she was watching her foal sleep and then just crashed herself. Now the interesting thing is that I never feel the urge to go wake up a sleeping foal… Since they sleep about half of the day until they are three months old, it seems normal to see them sprawled out on the ground. 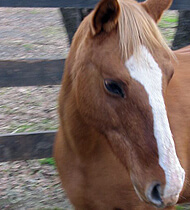 In fact, young horses sleep on the ground for longer and more often than adult horses until they are about 2 years old, according to the studies. Our furry buddies seems to be able to nod off during the most important times! You know, you are telling your horse all your trials and tribulations while you groom him and then you hear that distinctive deep breathing and lip flapping. Yup, he’s snoozing. 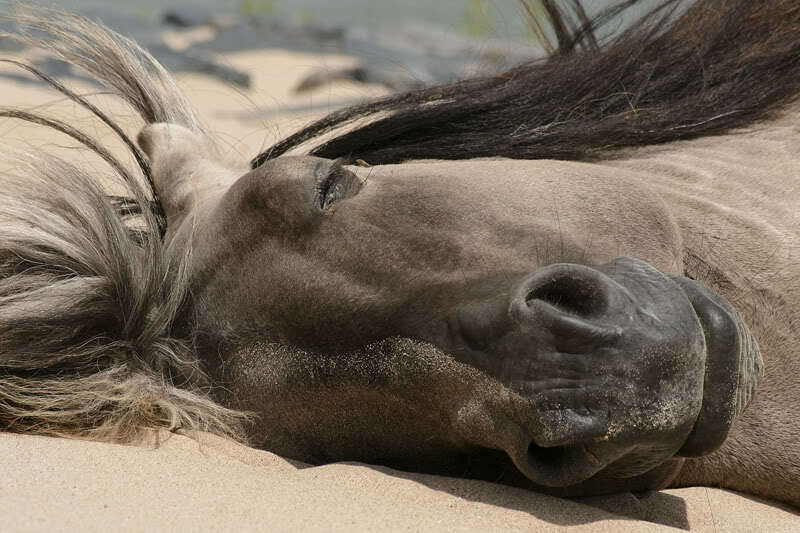 If you have ever watched your ‘laying down dead asleep horse’, you will notice his recumbent body twitching, eating, running, trotting, neighing and all other sorts of antics which can only be the accents to a lovely dream (we hope no nightmares). This horse looks like he is having happy dreams! 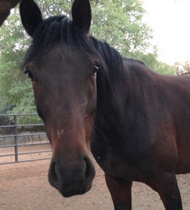 Horses won’t lay down if they feel afraid or uncomfortable. 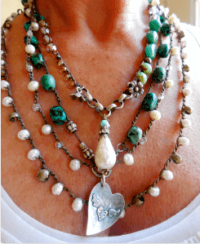 So, a new surrounding or pain or unusual circumstances will keep them upright. It has also been documented that if a lead horse lays down, the herd will follow. 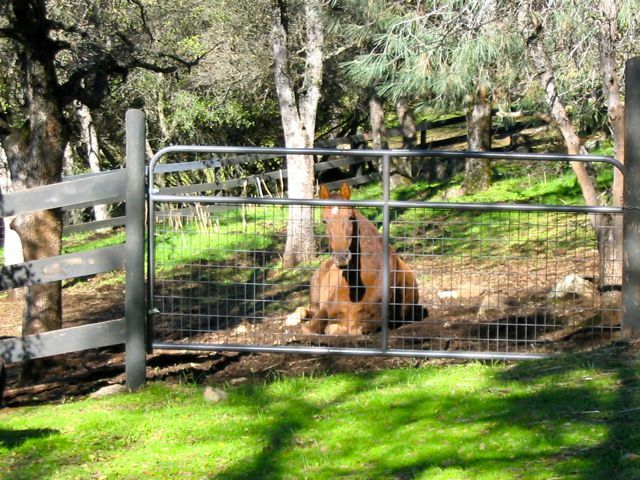 Usually one horse stays awake as sentry but not in all cases. It depends upon the situation. A horse will also lay down to sun himself. It seems to be an enjoyable and social event – to lay down in the sun. An entire herd will drop on a sunny day. Another fact that I found interesting was that horses prefer harder ground. 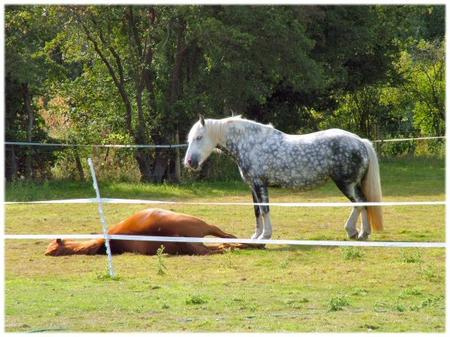 In the sleep studies, horses always chose the hard ground over soft bedding. Hmmmm. Bummer. 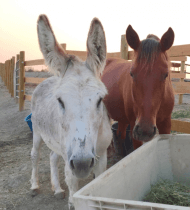 I know I feel better when they are heavily bedded… but it is true, I often see my horses out in the pastures sleeping in mud, or hard ground or poo piles. It just doesn’t matter. For anyone who has ever had a downed horse, you know how important it is to get them up before irreversible internal damage occurs. Can he breathe like that? I don’t think I will ever be any better about needing to wake up my sleeping horses because they look dead to me. But, at least they know they can get a few winks when I’m asleep. Heck, maybe that is exactly why most horses sleep between midnight and 4am – so that we humans won’t run over and wake them up! “TAIL LIGHTS” – What a great idea! Thank you so much for putting my mind at rest. I pass a horse refuge every day on my way to work. I often slow down to see who is there (pity the other drivers) and I was shocked one day last week to see no fewer than three of the fifteen or so of them lying down, and none of their people were outside tending to them! After reading your article, the fact that so many of them were sleeping at the same time and during the day probably means that they feel safe where they are. I’ve also seen one or two of them rolling and playing on their backs in the sun. They just looked delighted! Not only happily informed, but extremely entertained. Thanks horse guy! Funny!! !……now i dnt have to worry anytym lee is having one of those sunny nap especially in funny positions…tnks a bunch! And I’d like to add another comment to the few people who were critical of this blog., although their negative comments are dated and they are apparently not commenting anymore. 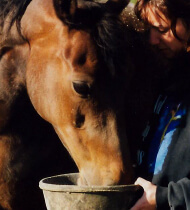 I am not a novice horsewoman…I am 50 years old and grown up with horses my entire life. 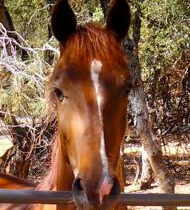 But until recently, I have never, ever seen this type of behavior in any horses I have known, and frankly, when I do wake up my Sleepy Beauty (whether running out shouting her name, or quietly nudging), I am usually met with a nice though drowsy attitude, that, as mentioned, probably was life-saving. My horse sleeps harder and deeper than my man!I believe the joy in our voices when they wake to hear our concern, makes them realize how much they are loved. OMG! I thought it was just me and my new mare! 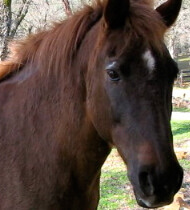 I lost my 23 yr old gelding (who was my beloved and trusted partner for 20 years…we rode w/o saddle or bridle or even halter for 10 years) last year and will NEVER EVER forget the horror of waking up and finding him dead in the pasture. 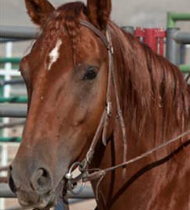 I ended up replacing (well, not really of course) him with a newly purchased 10 yr old mare (who apparently hates me by the way, but loves my man partner) and she drops and sleeps ALL the time. I can walk from the kitchen and look out on the pasture and she’s standing…and a few feet later, look out the living room window and WHAM, she’s down and sleeping. I can call out the window, run to the fence, walk up and SCREAM at her to wake up and it takes minutes to rouse her! WHAT is up with that? And when I wake her up, same thing…she’s like, “what the hay, I’m sleeping? 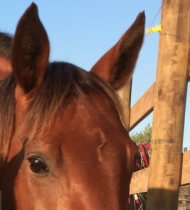 ?” I thought about making a vet call about it, but it seems to be her thing and I can’t afford it and she’s not the quality of horse (sorry, but she’s not show) to spend a fortune trying to figure out what the heck this is. Y’all’s stories make me feel better. So, I guess I am not crazy…Glory is! P.S. I always try to console myself by saying she might just be sooo comfortable here, that she can drop her guard…and drop. But still, it always makes my heart drop! Great story telling. I know the “oh no, my horse is dead” panic. 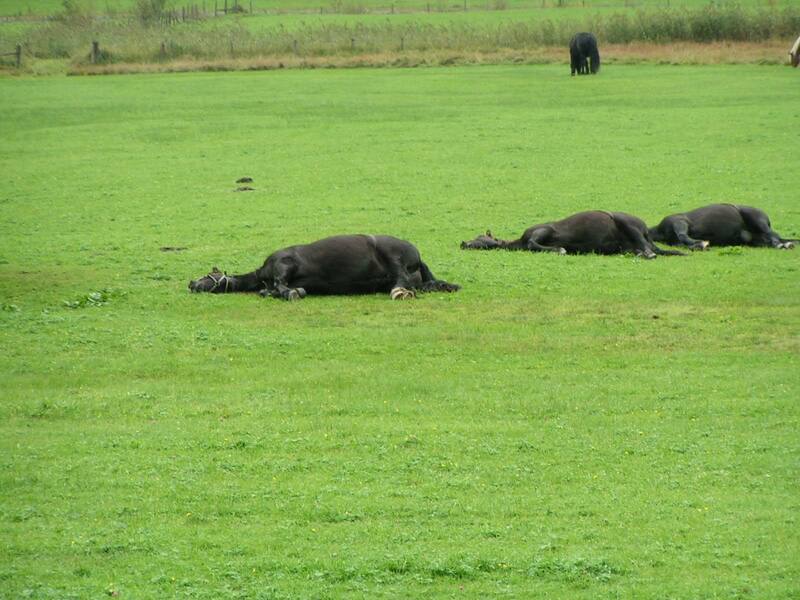 I was working at a horse rescue and not ever been around horses I didn’t know they layed down to sleep. I headed up the hill with my muck rake and bucket and Nuki was down! I went running up calling his name and poking him back to life only to see an irritated Nuki lift his head and look at me like I was crazed. I then found out that 10:30 was his natural lay down in the sun and sleep time. Whew! Well let me tell you! 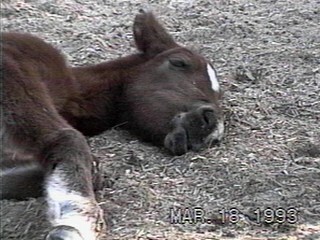 My VERY First horse, SISSY, when I got her, she LOVED TO LAY DOWN! And it was for more than an hour or two! Sometimes she would sleep the afternoon away. It took me many a times of seeing her laying down that I did not get worried and go check on her. I would look for her breathing and/or ear twitching. She was a laying fool! 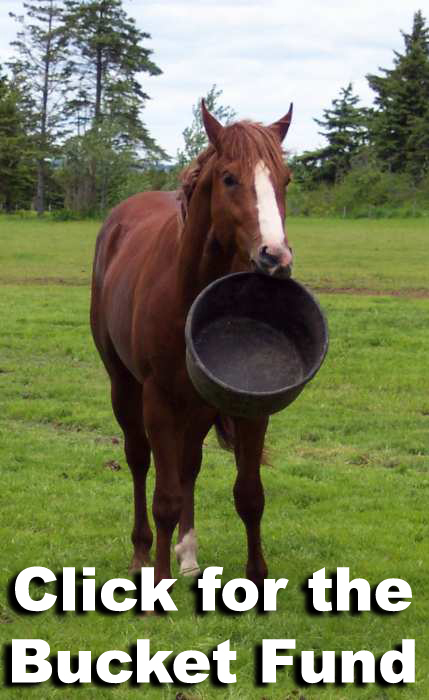 I have not ever had a horse since that has laid down that much. I actually rarely Catch Libby or the Donks laying down. Sometimes on a nice sunny day I will. But when I feed in the morning they will have shavings stuck to them and so I know they have laid down. Very good post and tons of information. (Giggled at the visions I had of you running to check on your babies)! 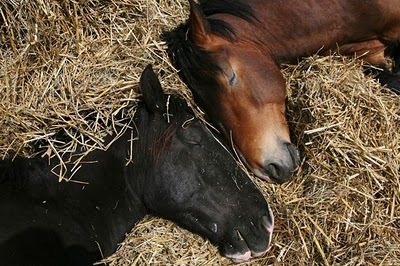 Interesting read about horses and sleep. Thanks! Great information and love the tinge of humor. Now what I really want to see, LOL is in the first part is a horse laying “HORIZONTAL” smiling!!! Great pictures and I love your story telling!! Blessings!! We have our one of pastures along a busy road and numerous times a year people driving by come tearing in our drive and yell at me that one of the guys are dead! I assure them that they are sleeping and many argue until I go prove it to them. Guilty as charged! 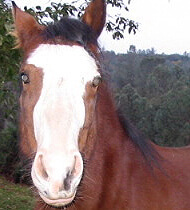 Our old horse (31 years old and just lost him )… would sleep throughout the day — over the last few years, I’d see him down and would go running over to get him up. He began to be aware of my hysterics and would completely ignore me or would open one eye only and then go back to sleep. Thanks for the post. I just saw one horse lying down and another standing vigil and I thought for sure he was dead. Before I called the owners, I thought I would google lying down horses so I wouldn’t look like such a “horse saviour.” (which I am, of course!) :) Good post. Thanks! “WHY HORSES WON’T LAY DOWN” struck a chord with me. One day I found my “almost” first horse flat on his side in his pen. 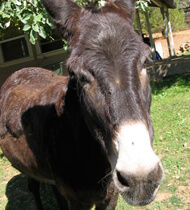 He’d been starved and abused, and hadn’t been seen laying down since he came to the Rescue several months earlier. I went into the adjoining pen, and, thankfully, discovered he was breathing. I think the reason he was napping (in the sun) had to do with his comfort level. He finally trusted that he was safe and the groceries would keep on coming! Once again, another informative post with a hearty dose of humor! After reading the other comments, I really had to shake my head at “Owner” comments. Finn would be up & running in a 5 seconds, long before you reached him if you were “really” screaming. The only prey animal that continues to lay around in that situation really is dead. Some people just aren’t able to distinguish between literal and figurative writing, or else maybe need to stand in the common sense line. 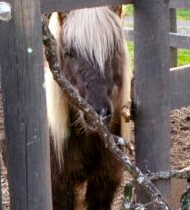 My one friend always harps on me for not having my stalls bedded real deep. I told her that when the horses are turned out they do not have bedding to sleep on and they’re just fine! Turns out I was right! 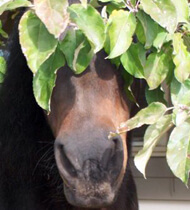 Horses prefer a harder surface. To say the least, I am not amused nor laughing. A responsible horse owner looks for a tail swish or muscle flinch, You NEVER run screaming at your horse for any reason (I realize you were hopefully trying to make a joke), *ESPECIALLY* when they are trying to rest. That is just plain Stupid. It’s no wonder so many people get hurt by their own horses. They are a living breathing beings, with feelings and reactions. I wish he could run screaming into your bedroom when you are trying to sleep, now *that* would be funny. Sweet Dreams. I laughed so hard I cried when I read this posting. This is SO me. 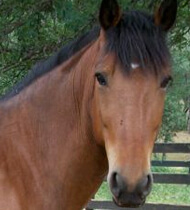 I have 76 horses and we run a non profit using many of our horses to work with disabled kids and adults. I have a camera in my barn for my oldest and more infirm horses and I leave the lights on all night long and stare at it until the wee hours to make sure they are all doing well. If I wake up during the night and cannot sleep I drive around to the pastures and paddocks and put my lights on the horses to make sure they are ok. They get really tired of me waking them up. It takes a lot of self control for me to not run up to them as they are sleeping. I have really startled them in the past. 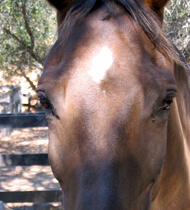 I probably have the most sleep deprived horses in the United States and needless to stay I am pretty tired too. I loved this!!! Laughed the entire time reading it! It is so so true. Thanks for sharing these great pics! My ‘little man’ likes a lie-down, a lot. He looks like a croissant out there in the field, soaking up the rays. Too funny and timely for me. Yesterday I noticed Kodi laying down so I very quietly walked up to him until he raised his head. I did not run screaming but nonetheless, I needed to make sure that he wasn’t dead. Thanks.